The city’s embattled Housing Authority chief showed up late for work Wednesday morning ​shielded by an NYPD ​officer — and refused to address ​serious ​allegations ​from investigators that ​she lied about conducting lead-paint inspections in thousands of low-income apartments. He used his torso to try to block The Post from snapping a photo in the lobby, then accompanied Olatoye as she walked to a nearby Italian eatery about 90 minutes later. 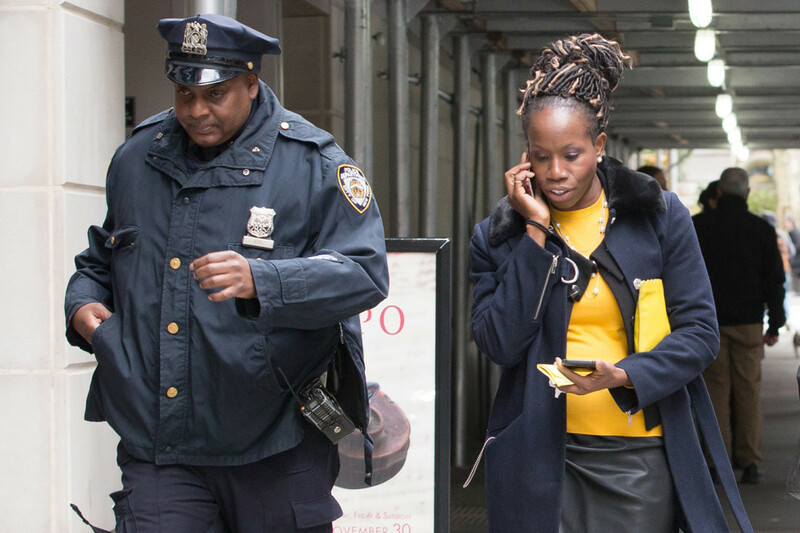 Olatoye was spotted chatting on her cellphone inside the Gran Morsi restaurant on Warren Street, while the cop paced back and forth on the sidewalk outside. An NYPD spokesman declined to say why it was providing Olatoye with that level of protection​ on the taxpayer’s dime​. Earlier, Olatoye ignored questions from The Post about Tuesday’s damning report from the city Department of Investigation, which revealed that she admittedly filed false paperwork with the feds last year. “That’s the appropriate way to talk about this matter,” she added. According to ​the ​DOI report, Olatoye — appointed by Mayor Bill de Blasio on 2014 — falsely told the federal Department of Housing and Urban Development that annual lead-paint inspections had been performed in 55,000 NYCHA apartments.